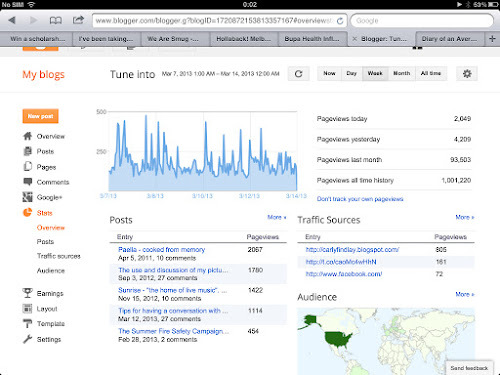 Tune into Radio Carly: One million hits and a blogging tip - Invest in those who invest in you. One million hits and a blogging tip - Invest in those who invest in you. 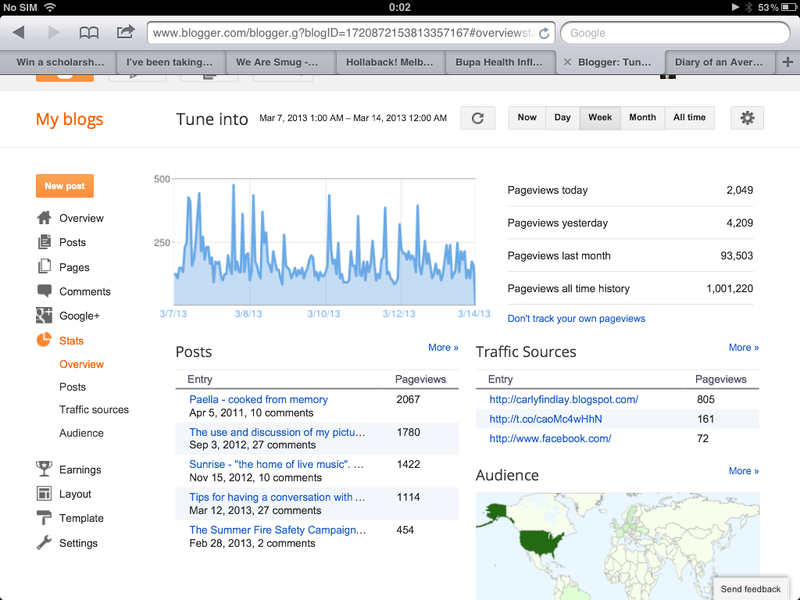 My blog has just clicked over past one million hits! Yay! It's been three years and three months since I started Tune into Radio Carly, and this project has been the one I've thrown my everything into. I've learnt you never work as hard as you do for yourself. This hard work has enabled me my dream of becoming a writer and speaker. Thank you to everyone who has visited, read, commented, shared, learnt something, and built a relationship with me - be it a friendship or professional network Thank you. While I still maintain that I blog for myself, it's been you who've buoyed me. I particularly love it that through sharing my story, others feel empowered to share their stories. It's wonderful to get to know people this way, and also to help people become more confident in themselves. I wrote about talking to people with visible difference on Tuesday. I've had an incredible response to this piece - so many comments, messages, shares via social media and most importantly, pride from my parents. Thank you for taking the time to think about the issue and continuing the conversation. Too often I see bloggers (and writers in the mainstream media) push out a blog post only interact with their clique, overlooking those loyal readers who take the time to read and comment and share their posts. Emails and tweets of support receive no replies. And sadly, sometimes they don't even interact outside their circles on social media. I see celebrities - writers, actors, musicians - interact so well with their fans on social media. And I see high profile bloggers who could learn from these celebrities. Bloggers, take the time to engage - especially when your blog forms some or all of your income. Have some two way conversation with your readers on your blog and social media channels. Thank people for sharing your blog with their friends. Reply to the comments you receive (I try to, and see lots of bloggers who do this well). And acknowledge those who have been loyal supporters. When you have time, stop by and read their blogs and share them with your networks. Take the time to meet with readers you haven't met before when you go to blogging events. They'll be chuffed you chatted with them, especially if you left your regular blogging circles. If someone references you or mentions you in their blog and tells you about it, thank them. I can't always get to all the blogs I want to, but I try my hardest. While building a new and bigger readership is great, I also think it's important to treasure the community you already have. It's nice blogging manners. Congratulations on one million posts Carly. I've been reading your blog for a year now and I have always been delighted by your writing. Lovely to hear from you :) thanks for reading and anjoyijf my writing. Much appreciated. Congrats Carly - it's no easy feat to reach 1 million - it is hard work and it is about the engagement. I feel the word clique has been used in blogging of late - and a bit unfairly. I have friends I met in blogging up to three years ago who have become friends in real life because we would have become friends if we'd met any other way. I feel blessed that those friendships have been able to develop because my life is richer because of them. That doesn't stop me talking or interacting with anyone else. You're right - clique is a word we have to be careful with. Like you, I've formed lots of friendships thanks to blogging, and I don't see them as cliques. Excellent post Carly and congratulations on all your hard work paying off. Very inspiring. Congrats on one million hits Carly and great advice. Hey Carli thanks so much! One of the things I'm most proud of is being able to spell another version of Carly/Carli without thinking! Love this Carly and congratulations! Congrats Carly! And really great advice! Oh another Carly! This is a popular thread for Carly/Carli/Carlyn! I think your advice relates to everyone and not just in the blogging world. When it comes to friendships, relationships, work, and everything - invest in those who invest in you. One of the big things I took away from meeting you, something I'm still so pleased I got to do. You are so right - it applies to all sorts of relationships. I've stopped chasing those friends who don't pay me the same attention as I pay them, as mentioned in my women's day post, and I've done the same with bloggers. Time is too precious. Congratulations Carly. I look forward reading to your thought-provoking blog posts. You've been blogging a long time - wow! Great post and congrats!!! Well-deserved! One million....awesome milestone!! Congratulations and very well done! Champion effort Carly! And I agree wholeheartedly that interacting with people in a kind, considerate, but above all, genuine manner will garner returns - not only in terms of blog or business growth, but because of the great relationships that are built. Hey hey Andrea - thank you! Amd I love the way you take the time to respond on twitter. Congratulations, what an amazing milestone! That's great advice. I'm a very small player in this blogging gig, but I always try to reply to messages when I can, as I know how great it makes me feel when people reply to me. Gotta pass on the good vibes! Such great advice and very, very true. I think I've probably been guilty of it at times too. Something that I have to watch, even with just a handful of comments! Hey Corinne thanks for your comment. I haven't always replied to the majority of my comments, nor do I reply to every single one, but if someone takes the time to leave me a compliment or sends me an email, I definitely say thank you. I've become more kind full of interacting with readers since seeing those who don't Interact with me after I've taken the time to commend them. Fantastic Carly. And I agree completely with your advice. If nothing else it is just good manners. Congratulations, Carly, it certainly is a massive milestone. In such a short time! (even more of an amazing effort) And it's testament to your hard work and dedication to this craft. I've been blogging 8 years this year. My readers (and also the blogs I read) have come and gone, but certainly in the past couple of years in particular, I've made a concerted effort to reply to each comment and engage with people who have engaged with me wherever I can online. It's only polite! After all, I wouldn't willingly ignore a person in a room either. Great article, Carly. Congratulations on your million post milestone! Congratulations lady! Great effort, Wow! Wow Carly, 1 million. Congratulations! Just starting out with my blog so this is all great information for me. It is too exciting when someone not only reads my post but comments. Great to share the love, Thanks for the pointers. Ha ha love that an internet connection that keeps fading in and out tricks me into believing that my comments didn't post so I re do, re do, re do. Just checked and they actually did post so it looks like I'm a stalker on repeat. Oops, sorry about that. Congrats - what a huge milestone to reach!